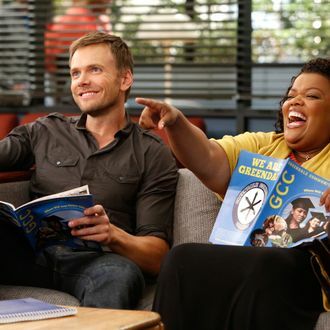 NBC chiefs made the right call when they decided not to dump Community on Fridays: Last night’s fourth season premiere averaged 4 million viewers and a 1.8 rating with adults under 50, according to early Nielsen data. That’s up 38 percent from what 30 Rock had been averaging in the 8 p.m. slot this season, and up 6 percent from what Community debuted to in September 2011 (when it didn’t have to face American Idol). Community also boosted Parks and Recreation to its best numbers since November 2011 and lifted The Office to its biggest rating in a month. None of this helped newbies 1600 Penn (1.1 demo) and Do No Harm (0.7), which sank to respective series lows. (It’s hard to imagine NBC not canceling Harm, seen by barely 2 million viewers Thursday, any minute now.) Elsewhere in the ratings, CBS’s The Big Bang Theory continues to soar (6.1 with adults under 50) while a heavily hyped episode of ABC’s red-hot Scandal ticked up to a series-best 2.8 demo rating.